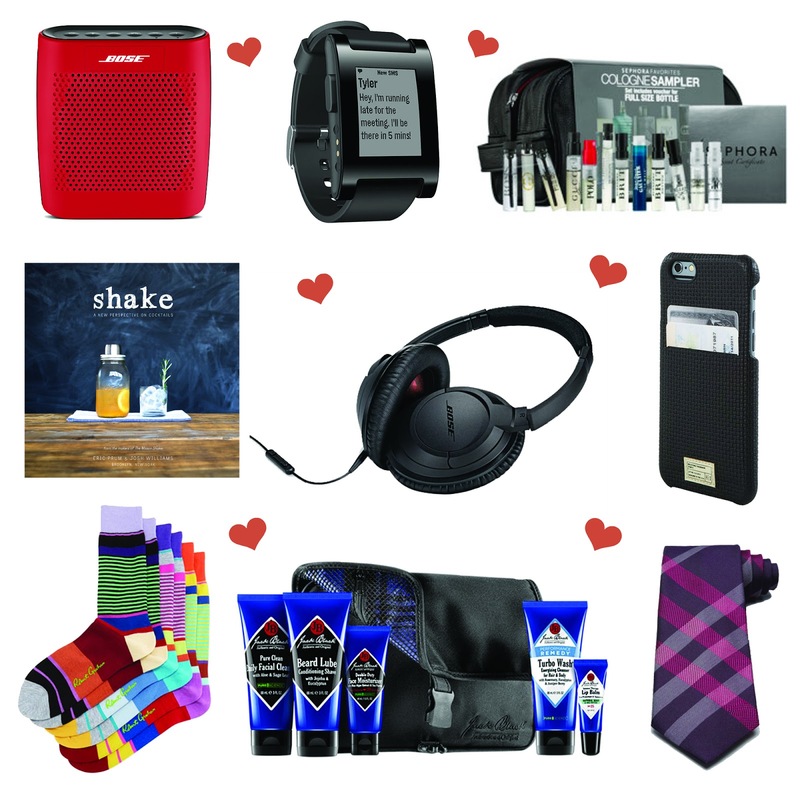 My last post was a Valentine's day Gift Guide For Her and today, I bring you the Valentine's day gift guide for men! These are just a few bits and bobs I think your man would love! A mix of fashion, grooming, tech and fun! Valentine's day is around the corner, so lets begin! Bose SoundLink Color Bluetooth Speaker: This cutie caught my eye while I was wandering around Nordstrom. This compact durable speaker connects with your bluetooth has clear, full-range sound that's perfect for anyone to jam to their favorite tunes! I love compact speakers because they are so easy to use and you can also travel with them. It has different colors but I love the red one! Perfect for the man who loves music! Pebble Smartwatch: I have seen this around everywhere! For those tech lovers out there, your guy will love this! It is basically a mini phone on your wrist. The pebble watch connects with Android and iOS devices via bluetooth. Pebble watches are compatible with a wide variety of apps and games, which can be purchased and downloaded from the Pebble app store. Basically you can do a ton of stuff on your wrist that you would on a smartphone! Love it! Sephora Favorites Cologne Sampler: Cologne is always a fun and easy option for a gift, but sometimes it can be personal. Some men like particular scents and this is the perfect gift for those guys! Not only do you get 12 samples of the Sephora's best selling colognes to try out in a faux leather toiletry case, but you also get a certificate, which your man can use after trying the samples to get the cologne he loved the most without any extra cost! Such a perfect gift and we all want our guys to smell good! Shake: A New Perspective On Cocktails: I have been wanting this book for a while, but I think it would be a perfect little gift for a guy who loves trying new drinks or even making them! Shake is a unique cocktail book that shows you how to make delicious and fast cocktails that are perfect for parties or just for fun. This book could even be a fun way for you two to do something together on Valentine's day or any other time. SoundTrue On-Ear Headphones: Another awesome present I think any man would love! New headphones are such a trend now and they are actually getting better! I love Bose headphones(more than the beats) and these are perfect for a guy who loves music or just needs headphones in general. The flexible, lightweight design features a softly cushioned headband and memory foam-padded ear cups that contour to your shape for hours of comfortable listening, which is super important when buying headphones. Most of them are too tight and give major headaches after a while, but these are pretty nice! They have various colors in this too! Hex 'Solo' iPhone 6 Wallet Case: I have seen quite a few of these phone covers around. I love that this is compact and easy for the on go kinda guy who doesn't want to carry a bunch of stuff in a wallet. Basic cards and ID fits right in with your phone! So handy for the non fussy guys and I think any guy would appreciate this! Robert Graham Energy 3-Pack Stripe Socks: Is it just me or do you think socks are such a cool trend for guys? Plus, they always need socks! These cool striped socks are adorable and I love how cool and trendy they are! For those fashion lovers and just guys who need new socks, I love these! They are good quality too which is always a plus! Jack Black 'Power Trip' Travel Set: Jack Black has some awesome products for men! I love this set in particular because it has anything a guy would need, skincare wise! It is perfect for those traveling peeps, but also for anyone to use at home! This set has a bunch of cool stuff like Beard Lube Conditioning Shave, Turbo Wash Energizing Cleanser for Hair and Body, Double-Duty Face Moisturizer SPF 20, Pure Clean Daily Facial Cleanser, and an Intense Therapy Lip Balm SPF 25 in Natural Mint and Shea Butter. If your guy is someone new to skincare too, this is perfect to get him started because he can experiment with tons of fun products! I know how hard it is to get guys into skincare, but these products are amazing and any guy will want to give them a try! Burberry London Woven Silk Tie: Getting fancy up in here!! I love a guy who can rock a nice tie! I love this one from Burberry and its such a cute Valentine's day present(you can match your outfit with it!) If your guy is a little fancy and loves his ties, he would love this. I love the color Beetroot, but it's also available in a navy color! Fashion lovers will appreciate it this!!! So those were all my fabulous presents for men! I hope this helps some of you and you enjoyed reading! I wish you all have an amazing Valentine's day! Even though it's considered a day for your significant other, spread the love around, everywhere! Love is free!!! Haha! Let me know what you guys are getting your loved one?